The 8/26/2011 issue of netgov (http://www.nextgov.com/nextgov/ng_20110826_6276.php) had an article “Analysts say online ‘hactivism’ is becoming a preferred tool of protests”. The article proposes that Computer Network Attack (CNA) has emerged as a powerful force for protesters. The article talks about the protests against the San Francisco centered Bay Area Rapid Transit System which appear to be organized by the group Anonymous. That group has innovated in its TTP (tactics, techniques and procedures) by combing CNA with on ground activity. The attack vectors are dependent on the desired result. If the group is looking to harm a target whose actions it opposes, it has turned to cyber attack as in the case of attacking Visa because it decided to stop accepting donations to Wikileaks. Where the goal is more traditional – say blocking traffic, protesting on subway platforms or interfering with the daily commute the organization will demonstrate physically. 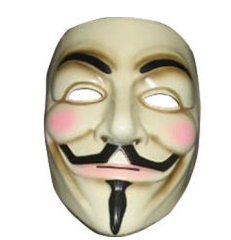 They shield their identities in a number of ways with the Guy Fawkes mask featured in the movie “V for Vendetta” being a common means. When dealing with urban AOs today’s MISO needs to be at least as flexible and techno savvy as our adversaries and enemies. We must appropriately employing digital influence and digital PSYACTs. Unlike non-state actors, military organizations must play by the rules. Unfortunately, in the case of the digital world the laws, rules, and doctrine have not kept pace with the battle. Computer Network Operations (CNO) are still pretty much behind the 21st century ‘green door’ and tactical MISO soldiers are not likely to have the CNO tools and authority. MISO is often marked by innovation on the ground, SWC and the MISO chains of command need to support digital influence in a big way. Perhaps the new MISG can establish a joint ‘center of excellence’ with the other PSYOP Groups to develop doctrine, and TTP. This Digital MISO Center of Excellence should be located at the Naval Post Graduate School so that it could benefit from the latest in IO thought leadership. Fort Hunter Liggett should be considered as a proving ground where the technique could be honed in relative isolation and supported by both Active and Reserve personnel. After some careful research with highly credible sources, I've decided to revise my position on the Israeli/Palestinian kinetic PSYACT post. Rather than any form of information engagement, the two factions are much more like heavy weight fighters whose only strategy is to keep punching no matter what. Neither side seems willing or able to come up with a realistic desired end state. Consequently no amount of psychological influence whether through information or via PSYACTs is likely to have a positive effect. Monterey: The Promised Land for CA and PSYOP? Monterey, California is among the nicest places in the world. The Pacific is breathtaking and it boasts a variety of natural and manmade treasures. And even though it is not exactly a low rent neighborhood, it hosts the Defense Language Institute (DLI) and the Naval Postgraduate School (NPS). The NPS is among the most progressive of military institution and has successfully positioned itself as a “Center of Excellence” in several areas such as Information Operations and Homeland Security. Interestingly enough it has also pioneered the concept of a Civil Affairs (CA) Center of Excellence and there is talk of creating a similar PSYOP institution. Given the world situation, the optempo and the growing need for both of these critical missions, the time has certainly come. There are also significant murmurings of the reserve components for CA and PSYOP to once again be part of the SOF world. This is another move that is long overdue. Both CA and PSYOP need to nurture the academic side of their branches. Both branches will face heightened demand in the 21st century because they are vital across the spectrum of conflict. Faced with a changing political and technological environment in which to operate, the branches need to have some academic space to think about how to optimize the way their soldiers are prepared to execute the mission. This type of strategic/academic thinking is best when not influenced by the current doctrine so as to avoid tunnel vision and the ‘we always did it that way’ syndrome. Kudos to all those involved and be prepared to write your Senator and Congressperson when it comes time for budgets and funding. The Middle East is among the most complex of all information engagement battlefields. Religious and historical overtones often over shadow political realities and generations of conflict lead to an inbred sort of hatred that is generally hard to overcome with reason and/or economic incentives. Media in Gaza continue to show anti-Israeli programs to audiences of all ages and Israel for its part tries to bolster its position on the world stage while attempting to assuage its own population. Rockets from Gaza are met with air strikes. Groups claiming responsibility for attacks on Israel find themselves targets. The Israeli government, unlike the US government is more than willing to quickly commit lethal force when it feels that commitment is justified and in its best interests. From a MISO/PSYOP perspective, one would expect that these kinetic actions are complemented by cyber attacks aimed at high value targets via their mobile phones, e-mail, etc. While militants put on a tough face in public, they cannot change how they feel inside when it appears that the bell is indeed tolling for them. Small Artice - Big Potential? The President’s Iftar (post Ramadan celebration) dinner comments also mentioned that Muslims died in the attacks and are part of America’s armed forces. I wonder why we haven’t profiled some of the survivors, especially those who are pious and well respected? Perhaps this is a good theme for the 10 year anniversary of the attacks next month. After the attacks I recommend that we personify the Muslim victims to show that the terrorists had killed their own people. People stories, especially those with images and emotional overtones are powerful influencers. Profiling the innocent victims is a fitting memorial which may also help to prevent future such tragedies. The past few days in early August 2011 have not been good ones. A helicopter carrying a Seal Team was shot down in Afghanistan probably by enemy RPG fire; the City of London and other parts of the UK are ablaze with riots and crime; and of course the US stock market is a punching bag. Each of these provides a basis for enemy propaganda across the combat spectrum and at all levels of information engagement. Our enemies will no doubt make good use of these events for their own good and we need to strike with aggressive information engagement before the enemy propaganda effort gains momentum. On the tactical level, no doubt the Taliban and others will claim a miraculous victory and use their extensive ‘word of mouth’ network to spread their messages. ISAF’s best COA in my opinion is to continue their optempo at the same or greater level as before the incident. Concentration on a few high value targets (HVT) would increase pressure on those targets and send a psychological ripple through their respective organizations. At the moment, it appears that the violence in the UK is racially rather than politically motivated, images of police attacking minorities is always useful to the enemy as a means of ‘documenting’ persecution by the infidels. Counter to this is to graphically show the criminal nature of the violence and if possible innocent victims. As for the stock market – the target audience would have to be a sophisticated one so that this might figure into a long term enemy recruitment strategy showing how the Western promise of equal economic opportunity is a sham. Given the market’s recovery, the counter is what my financial advisor tells me and that is the market operates in cycles and what goes down invariably comes up. We can suspect that as the 2012 presidential election comes closer, more measures will be taken by President Obama’s administration to make it appear that the economy is recovering. In any event, let’s all hope the news gets better over the next few weeks.